Amy and David are a part of our Sunshine community. They have been married for 13 years and have three children. RaeAnn, the youngest, was adopted on January 2, 2018, at the age of 4. RaeAnn has Congenital Heart Defect with Transposition of the Great Arteries, Pulmonary Stenosis, and Ventricular Septal Defect. 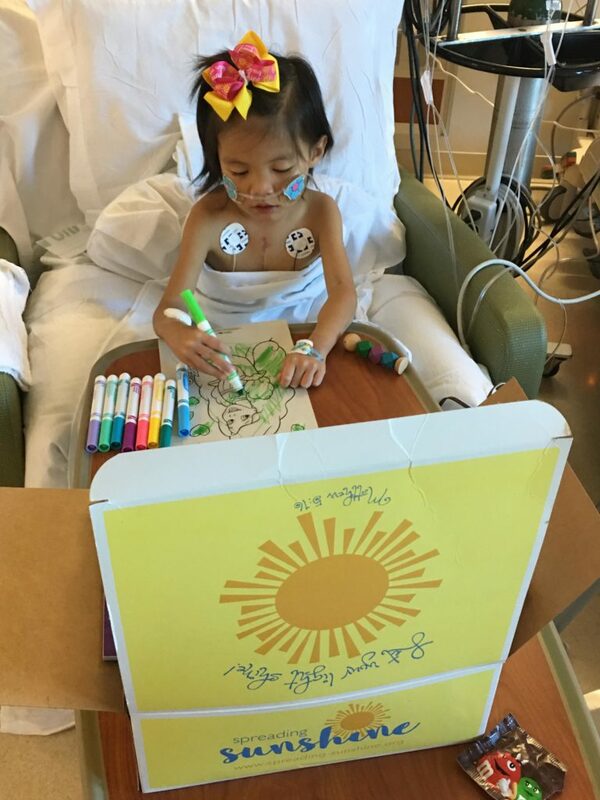 In 2018, RaeAnn spent a total of 97 days at Le Bonheur Children’s Hospital in Memphis, TN where she had three heart catherizations and three open heart surgeries. Amy shares her story of obedience. In order for you to understand RaeAnn’s story and the why we choose obedience, I need to start of the beginning of my call to adopt. Ever since I can remember I have had a love for the Chinese culture. Growing up, my dad would take me to Chinese restaurants. It was our thing to do together. I would have conversations with the owners and they would share their culture with me. In college, God began to stir in my heart to go to China. I thought about applying for the International Mission Board to be a Journeyman. God led me to Ohio and I became a Campus Minister at Wright State University where I met several international students and built relationships with them. In 2002, I had the privilege of traveling to China as an exchange student and spent 10 weeks soaking up the culture. It was there that I saw the need to adopt girls from China, and it was there God called me to adopt one day. Two years later I met David. We began dating and I told him about my call to adopt a little girl from China. We joke about it now, but this was a huge condition on us moving toward marriage. I was doing this and if he wasn’t interested then “hit the road Jack!” My calling became our calling. We were married in 2005. In 2012, David lost his church position and was unemployed for 2 years. I went back to work and we watched God provide for our family every step of the way. In 2014, David became the Worship Pastor at East Side Baptist Church in Paragould, AR. We had no savings. Everything we had built up was gone. There was NO way we could afford to adopt. 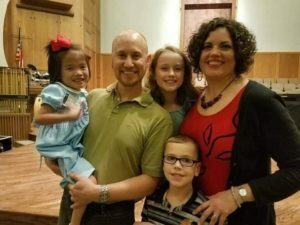 In early summer of 2016, I began praying about adopting. I struggled with God and eventually laid down my desire at His feet. I told David that I didn’t like it, but God was working in me to trust Him with the fact that we may never adopt. This hurt, but I had to trust that God knew best. In July 2016, we were contacted by a family. We spent an evening with them and they asked about our plans to adopt. After we shared our story with them, they asked what was holding us back. David and I expressed that we were just getting back on our feet. Finances were one of the biggest things that I had laid at God’s feet. There was no way we could even entertain the thought to adopt. The gentleman asked if we had a name for a little girl if we did adopt. RaeAnn Michelle, after her two grandmothers and me. She would be a part of us with David’s mom’s middle name, my mom’s middle name, and my middle name. The gentleman handed us a check and told us to go get RaeAnn. Sometimes obedience is surrender. Sometimes obedience is never giving up hope. Obedience is ALWAYS the best place to walk with God. Our obedience didn’t end there. When we filled out our medical checklist of the type of child we were willing to adopt, RaeAnn was never on that list. We said minor heart issues would be okay. But once again we walked in trust and obedience. We knew God would provide as He already had. The first time I read RaeAnn’s medical file, I thought, “Can we do this? Can we take on a child was a complex heart condition?” We did not know what we were walking into, but we had hope. We didn’t know what our future would hold, but that is the beauty of obedience. I would say 2018 was a year of dreams turned to reality, but it was also a year of trial and separation. Obedience is not easy. When you choose obedience it is not always sunny. I think about Jesus and His journey to the cross. He had wonderful times of healing and teaching. He also had times of grieving for our sin and His cup to die for us. He chose obedience to God’s calling. He modeled the way for us. We have to choose obedience every day, every step, every moment. We have to decide to reject fear and embrace trust. 2018 did not go the way we hoped or expected. We hoped that RaeAnn would go to the cardiologist and miraculously be healed. We hoped that her open heart surgery in April would be a success and we wouldn’t be looking at another surgery in 10 years. We hoped that August would be the fix she needed. The amazing surgeons at Le Bonheur knew her heart now. They knew us and we had built a relationship. This would be it for years. Then in October, RaeAnn almost died. Thirty days in the hospital and we were staring down another risky open heart surgery. We did not have unity among the doctors, but we had unity in God’s promises and a peace. A peace that surpassed ALL understanding. 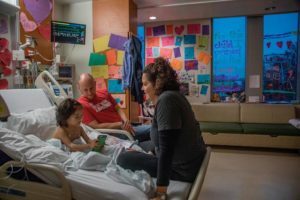 RaeAnn had her third open heart surgery in seven months. We witnessed our surgeon choose obedience. Obedience to a higher calling. Obedience to his vast experience. Obedience to his love for the children he serves. Obedience affects all of us. If I choose not to obey, then the affect reach others besides myself. Our surgeon said that he knew God was with him in the operating room. We continue to rejoice in the choice of obedience. We are not superheroes for adopting RaeAnn. We are not special because of what we have been through in 2018. We are just obedient. We wake up every day thanking God for the calling, ask for the wisdom to make decisions through the day, and rejoice in whatever may come our way. I pray you will choose obedience in whatever God calls you to do. The Spreading Sunshine community is filled with families, like RaeAnn’s, who live their story and CHOOSE TO SHINE in the midst of sometimes difficult circumstances. Do you know someone whose child could use a little encouragement? You can send them a Sunshine Box designed to give joy.